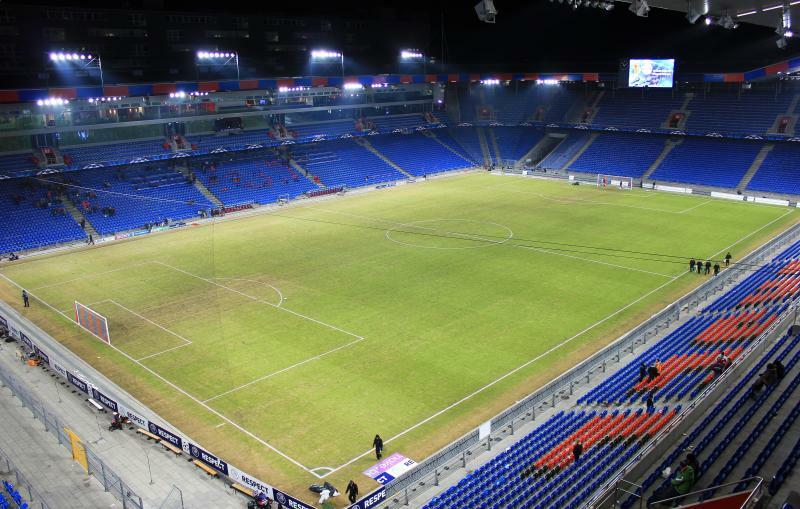 St. Jakob-Park, nicknamed Joggeli, is the largest stadium of Switzerland. Construction of the stadium began in December 1998 after the old St. Jakob-Stadion that stood in its place had first been demolished. 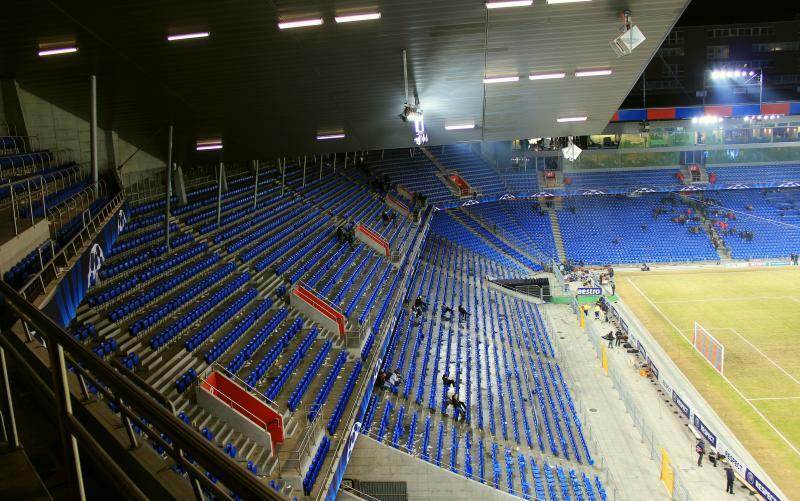 The first match played at the stadium was between Basel and Lausanne Sport on 15 March 2001. Six months later the stadium got officially inaugurated. Total construction costs amounted to CHF 250 mln. St. Jakob-Park initially had a capacity of 33,200 (of which 9,000 standing), but got expanded with an extra tier on one of the long sides for the Euro 2008 tournament. With an additional few extra rows of temporary seats, capacity was raised to a total of 42,500 seats. After the tournament capacity dropped back again to under 40,000. During the Euro 2008 championships, three group matches, two quarter-finals, and the semi-final between Germany and Turkey (3-2) were played at St. Jakob-Park. In 2016, St. Jakob-Park hosted the Europa League final between Sevilla and Liverpool (3-1). 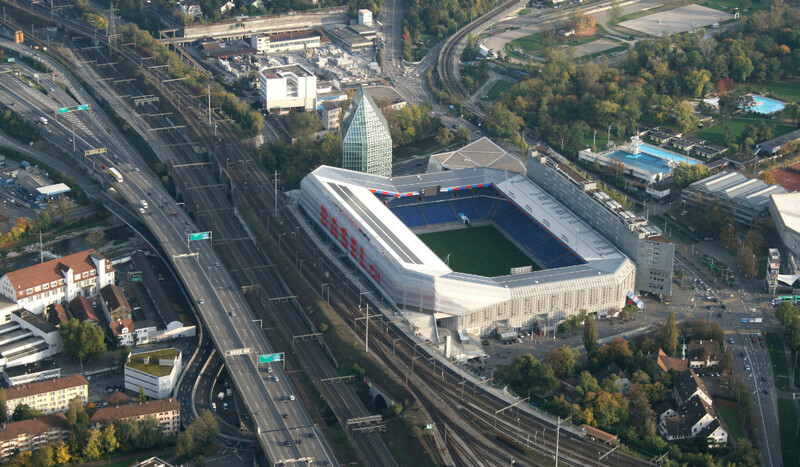 St. Jakob-Park is located in the south-east of the city of Basel, about 3 kilometres from Basel’s city centre and slightly less from the central railway station (Bahnhoff SBB). 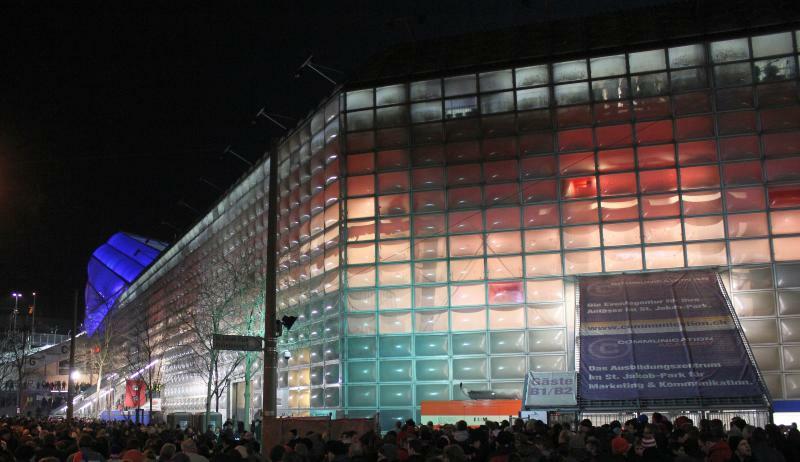 Part of the St. Jakob-Park complex are a shopping mall and a 70-metre tall residential tower. The stadium lies adjacent to the A2 motorway. Take exit St. Jakob. St. Jakob-Park has its own train station with the same name (St. Jakob). Regular trains depart from Basel’s central station for the 8-minute journey. Tram line 14 connects the stadium with Basel’s old city centre. Get off at stop St. Jakob. Bus 37 also connects with the centre, and bus 36 with the north bank of the city. St. Jakob-Park lies right next to a set of railroad tracks and a motorway in an area which is a mix of other sports facilities, light industry, and residential housing. St. Jakob-Park Shopping Center is located inside the stadium and offers a few restaurants and cafés, but overall there is little around in terms of eating and drinking, which you can therefore better do in Basel’s city centre. There are few hotels near St. Jakob-Park, but if you do need to stay close, then the small B&B Auf dem Wolf is an excellent option. It lies right next to stadium and gets splendid reviews. Hotel Coop is an alternative that is also at walking distance, but apart from that the options are limited. Click here for an overview of the hotels near St. Jakob-Park, and here to explore the options in Basel’s city centre and elsewhere. Tickets for FC Basel games can be purchased online, or at the ticket office at the stadium. Tickets can also be bought at the gates of the stadium on the day of the match. 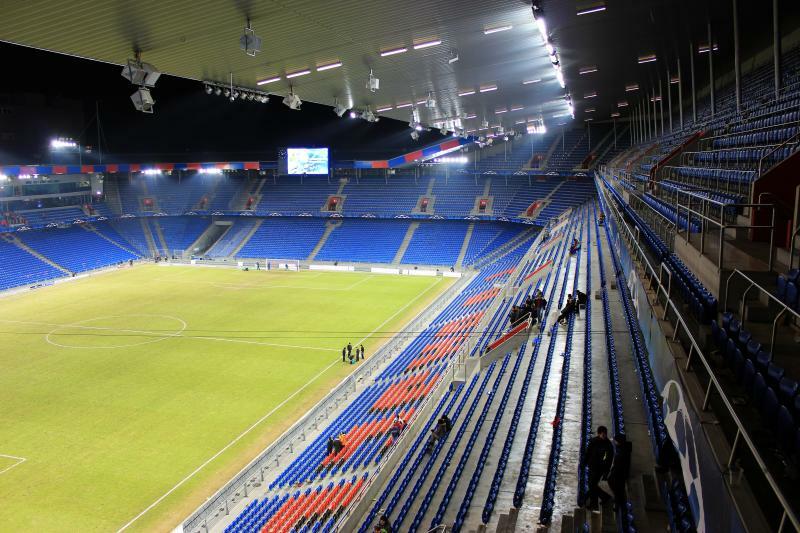 FC Basel has the highest attendances of the Swiss Super League, but doesn’t often sell out its home league matches. Ticket prices range from CHF 25.00 to CHF 36.00 for a seat at one of the short ends to CHF 75.00 for a seat at the main stand. For more information call +41 61 375 10 10 or email ticketing@fcb.ch. 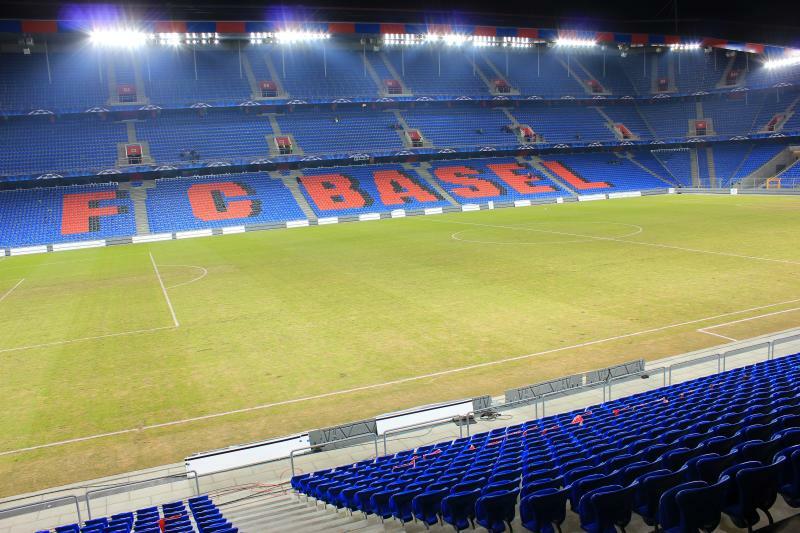 Basel occasionally organises guided stadium tours around St. Jakob-Park. Check the official website for future dates and prices, or email stadionevents@fcb.ch for more information. Fcb.ch – Official website of FC Basel. Baselunited.ch – Website of St. Jakob-Park stadium management. Basel.com – Basel tourist information. BVB.ch – Journey planner, timetables, and fare information for Basel public transport. Went to the St. Jakob-Park for this year Europa League final. Was lucky enough to get my hand on a ticket some time before the game took place so I was able to plan well ahead. From opposite the main train station I took tram 10 and went 4 stops. Then a 10-minute walk was required to reach the stadium. Uefa closed stations close to the stadium for safety reasons I believe therefore I could not use the directions from above. After the game I opted for a 20 minute walk in straight line that got me to railway station. Stadium itself is ok. Modern and nice. Basel is well connected with France and Germany so you can plan to visit more countries during the same trip.